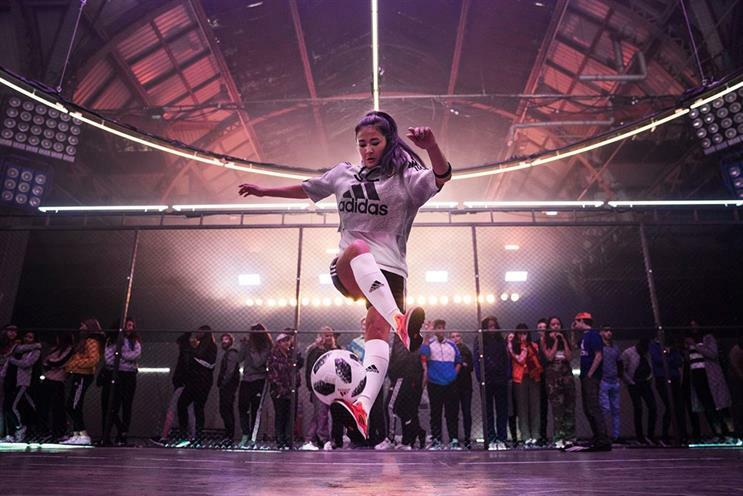 MediaCom has scooped Adidas's estimated $300m (£229m) global media account after a competitive review. Adidas, which used MediaSense to manage the pitch process, has contacted agencies about its decision. A spokesman for Adidas confirmed MediaCom's appointment, saying it wants "the right line-up of partners onside with us" who are "consumer-obsessed, digitally-focused and always creating the new". Adidas has previously said it will focus its marketing on six, global mega-cities: London, Los Angeles, New York, Paris, Shanghai and Tokyo. "Through our new partnership [with MediaCom], we look forward to innovating ways of reaching and connecting to our consumers across the trend-leading cities whose influence on global culture is the key to unlocking desirability and demand," Adidas said..
"We would like to thank Carat for their partnership over the last 19 years and for the successful work we have created together." Adidas' decision comes midway through the Fifa 2018 World Cup – a key event for the German-owned sports brand, which has been an official sponsor of the tournament for 20 years and sponsors a string of teams, including Argentina, Belgium, Colombia and Germany. Adidas hiked its annual marketing spend by 13% to €2.73bn (£2.4bn) last year, according to its 2017 annual report. Industry sources estimate its paid media spend is likely to be between $300m and $400m. "Marketing expenditure is one of our largest operating expenses and at the same time one of the most important mechanisms for driving brand desirability and top-line growth sustainably," the owner of the Adidas and Reebok brands said in its annual report. "Therefore, we are committed to improving the efficiency of our marketing investments. This includes concentrating our communication efforts on key global brand initiatives and focusing our promotion spend on well-selected partnerships with top events, leagues, clubs, federations, athletes and artists. "We also aim to increase operational efficiency by tightly managing operating overhead expenses." The subsidiary Adidas brand currently spends almost half of its marketing investments on promotional partnerships including on teams such as Manchester United, Real Madrid and the New Zealand All Blacks, as well as individual sports and entertainment stars such as Lionel Messi, Gareth Bale, Kanye West and Stella McCartney. The other half is spent on brand marketing activities such as digital, advertising, point-of-sale and grassroots activations. Adidas said it plans to reduce the ratio of marketing investments spent on these promotional partnerships to less than 45% by 2020. MediaCom’s win comes despite uncertainty over the future of parent company WPP, which parted ways with Sir Martin Sorrell in April and has not yet found a replacement for the chief executive. The agency is facing a flurry of activity as it is also defending Shell and has expanded its relationship with Sky across Europe after a competitive review. MediaCom decided not to defend another client, Revlon, which awarded its global media business to Initiative earlier this week. A spokesman for Dentsu Aegis said: "Carat is proud of our 19-year relationship with Adidas and Reebok, and the work we have created together during this time. "We thank Adidas for their partnership over the last 19 years and wish them every success in the future."